Megan Lerer is from Ellicott City, Maryland and currently is a student at James Madison University in Virginia. 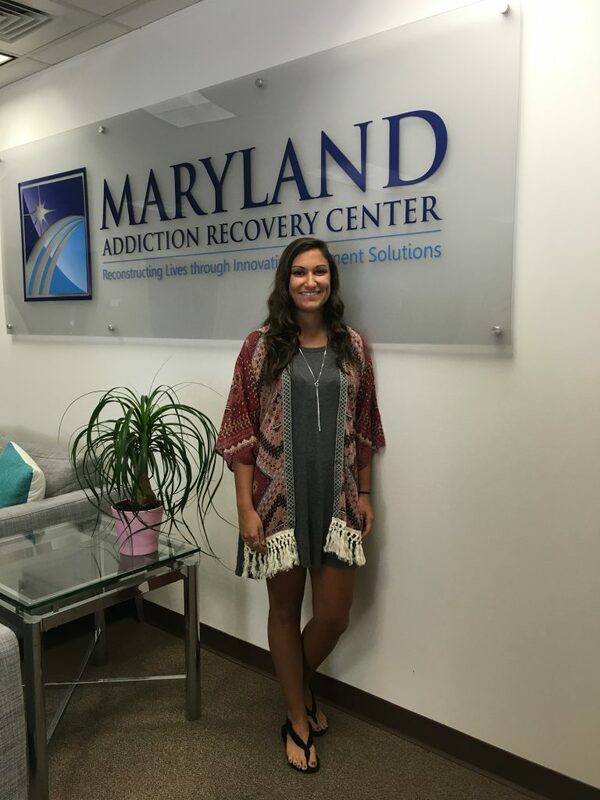 During the recent summer of 2016, she spent six weeks interning at Maryland Addiction Recovery Center. This is her account of her experience and how it shaped her perception of addiction, treatment and recovery. “The meaning of addiction and recovery differs from person to person. An individual’s perspective on addiction comes from their experiences, environment, family history and more. Every individual knows someone suffering from addiction. This someone may be ones boss, parent, friend or a number of different people. As a twenty-year old college student, substance abuse and addiction occur everywhere. The college environment makes substances so easily available, in which it allows adolescents and young adults to become more susceptible to using and increases the risk for potential addiction. The regularity of drugs and alcohol seen in a college environment makes it feel like it is okay to use because you are “young” and “in college”. Over time, it appears the use of drugs and alcohol has increased and the knowledge of the risks behind the act of using said substances has decreased. My environment and my experiences have shaped a certain perspective on substance abuse and addiction. Before interning at Maryland Addiction Recovery Center, I had a very narrow view on what addiction looked like. I reside in that college environment where substances surround me through friends and colleagues. Substances also surround me through my family. I have family members suffering from addiction and their actions and decisions have impacted the rest of my family and me. Before M.A.R.C, I thought of addiction as a disease, which I learned to be correct. It surrounds me in many different ways, but I had very little knowledge on what disease really meant in the case of addiction. Within my family, addiction is an unspoken issue; one that everyone knows has become a problem but is always pushed underneath. In school, colleagues and friends do not speak about what they are potentially risking by using a substance. Most of the time, drugs and alcohol are not viewed as dangerous or negative on a college campus. Being in these environments have shaped this perspective where I know it is a growing problem that no one is really doing anything about. My experience at M.A.R.C gave me the opportunity to gain the knowledge and understanding of a world where using and abusing substances have serious consequences. My mentor, Cheryl Caplan-Zalis, was an amazing instructor whom I am very thankful to have studied under, as were all the employees and clinicians at M.A.R.C. During my first week, I learned the jobs and responsibilities of every staff member including all clinicians, residential managers, executive and all directors. This allowed me to learn the professional structure of the company itself and the mission statement of the facility. Throughout my duration at M.A.R.C, I was given the opportunity to shadow every clinician. This experience allowed me to learn the different styles and techniques of each therapist. I observed how different clinicians interacted with their/other patients and the way they conduct group sessions. My responsibilities included observing and sitting in on intensive outpatient groups, the partial hospitalization program, outpatient, clinical meetings, case-load groups, gender-specific groups, individual and family sessions, and processing with each clinician following groups. The group that influenced me the most would be the IOP and PHP group. Interning for a short period of time made it difficult to get to know and learn about each patient’s lives and history of addiction. I spent the majority of my time with the IOP and PHP clients. The stories of the patients all were very different, yet so similar. They impacted me in ways that is difficult to explain. A majority of the patients were close to me in age, which became difficult at times. I also came to learn these clients are middle and upper class, which in the past, I never really associated those class titles with addiction. I believe this was a great learning experience, in which it taught me how addiction surrounds everyone everywhere and this also taught me how age or class is no obstacle to addiction. There are numerous factors that may lead you down a difficult path, but class and age does not matter and will not prevent you from suffering addiction. A significant part of my experience included learning to be in the professional word and conduct myself properly in a professional setting. The age factor of clients helped me achieve this goal to stay professional, as I had to learn where that line is between client and friend and the closeness of age made this challenging yet rewarding. I am thankful as this challenged me and made the learning experience that much more impactful, preparing me for future professions working with clients. As weeks passed, I learned the stories of the patients and the goals of the treatment center. For therapy specifically, I learned the language one must use when talking to patients and writing notes. I became more comfortable challenging and talking to patients in group and believe I successfully achieved finding that line and type of language to use. As I am still studying for my undergraduate degree, my career path is likely to alter. What I loved at this treatment center is that I was able to not only learn a tremendous amount about addiction, but I learned how factors of trauma, behavioral problems and mental illness associate with it. Observing individual and family sessions taught me that there is much more to addiction than the substance itself. There is trauma and mental difficulties that are associated with every person. One concept that will stay with me is, “addiction is a family disease.” I have heard multiple clinicians say this and for personal and professional reasons, I believe the statement to be very impactful. This program not only treats individual’s addiction, but also allows them to open themselves into seeing what it may have done to their family. This additionally allows the family to not only help the patient, but also themselves. In addition, this program seems to truly motivate people to better themselves and discover qualities that they may not get in another program or ever in their life. It was inspiring for me to see how passionate the employees at M.A.R.C. are about their work, the patients, and working every day to provide the absolute best long-term treatment possible for the individuals and families that need it.